What’s the name of the Archimonde Feat of Strength again? That’s right, it’s Time Is A Flat Circle. Sure, the name is a pop culture reference to some TV show or another but to me, it’s got another meaning. Full circle. I’ve completed the circle. At this very same time last expansion, I was frantically trying to get into a group to get my Garrosh AotC achievement. I was dedicated, that’s for sure, but my gear and numbers left much to be desired. Last expansion I was pugging into every group I could, hoping to get that one extra drop I needed to be able to get into a successful Garrosh group. Last expansion, a truly wonderful person named Khizzara and her guild <That Guild> helped me finally achieve my expansion long goal. They graciously took me under their wing and brought me in for my Feat of Strength and mount, just a few days before the patch dropped and removed the AoTC forever. And now this expansion, I return the favor. It’s a Monday afternoon, about one week before the launch of Warcraft’s next expansion, Legion. I was browsing Twitter as I am wont to do when I happened across a tweet of particular interest. Malkarii, a twitter acquaintance of mine, was looking to set up a last moose carry run before the end of the expansion. She wanted to run a low-key sort of event, just a group of friends hanging out in Twitch/Mumble, getting mooses for as many folks as we could before they disappeared forever. I checked my calendar and found that I was free on the day of the run. So, I shot her a DM, offering my services as a healer (or tank or dps should the need be great). We chatted for a bit, I mentioning that I could ask a few of my guildies if they wanted to come since most were geared to the nines at this point. The time of the run was established and we parted ways. Fast forward to Saturday evening. I’m hanging out in a raid with my guildies Rainspirit and Lorenyth (later to come are Bodhirana, Cloud, and Xunam). 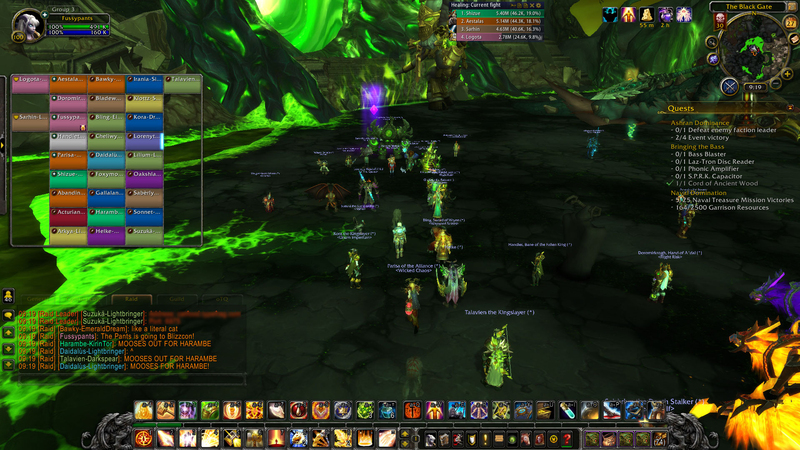 Us, along with about a dozen others are all grouped up and ready to start wailing on Archimonde. Then, we bring in the carries. It’s a scattered assortment of friends and guildies. Some more experienced than others but all eager and dedicated. The first couple of attempts are admittedly rough. We wipe a couple of times but keep coming back up and trying again. Then, we start rolling. 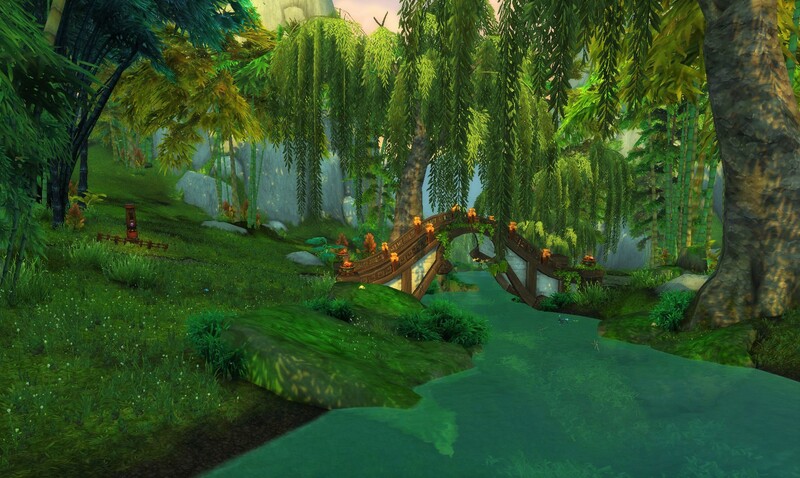 The stacks are stacked and the spreads spreaded and Archimonde comes crashing to the ground. It’s one successful run down. At this point, I unfortunately have to step out of the raid for a little while. I ask my friend Bodhirana if he’d like to come in as I don’t want to leave without finding a replacement healer and I’d trust Bodhi with my virtual life in a split second. Bodhi generously agrees to come with (you can read about his experience in his most recent blog post!) and I duck out for a while. After taking care of my real life responsibilities, I join back in the group. At this point, we are rolling. It takes more time to get every grouped up and explain the fight than it does to actually take Archimonde down. Malkarii is great, explaining the fight before every single pull. Yes, this may be a carry run but she doesn’t want folks to tap the boss once and go and stand in some fire. Everyone is working together as a team to accomplish this, let’s all try to remain standing at the end if we can! One run goes by, then another, then another! Pretty soon, I’ve lost count. 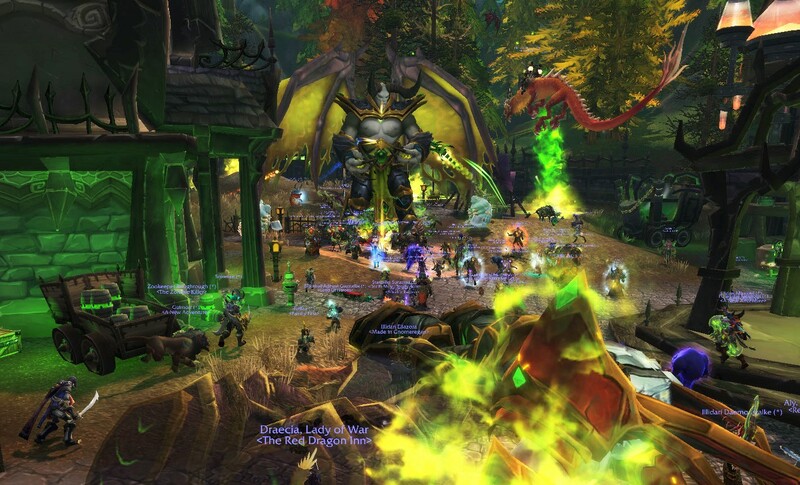 Dozens of hopeful folks come in seeking mooses and head out with the quests for their shiny new mount. And even though it’s the same boss over and over again, I still was having a ton of fun. I was chatting, cracking jokes, laughing at jokes, and getting to really make a difference for some folks. Call me cliche and call me corny but the truth of the matter is, I loved being able to do this. Just one expansion ago, I was one of those folks. Determined on getting the AotC mount but not lucky enough to be on a raid team to do it. Working on gearing up but running into the inevitability of pugs. This was me. And now I get to give back. Now instead of being the carried, I get to be the carrier. I’m offering these folks the opportunity to get the mount, I know from personal experience, they’ve worked so hard to get. Just like myself, they are getting in their mooses just in the nick of time due to the kindness of friends, guildies, and even complete strangers. I am giving the gift I once received myself. Huge, huge, huge thanks to my fellow guildies for coming along for the ride! Rainspirit (though I know you found out and joined independently of me but still, I’m going to mention you here! ), Lorenyth, Aestalas, Cloud, and Xunam, y’all are totally amazing folks and we couldn’t have done it without you. Thank you so much for joining me on this (totally optional!) adventure! And to all the other carries, those from twitter and those from somewhere else in the great wide world of Azeroth, thank you as well! Had there not been our two trusty tanks or our dependable dps, I would not have been able to complete the circle. Thank you for running with me! And finally, Malkarii. I know you don’t want to be showered with accolades or follows or anything but I do want to say, thank you. Thank you for organizing this, for making the call to run the extra hour, for bringing together all the carriers to make this run a reality. You rock lady! Time may be a flat circle, but now it’s also a complete circle. The Legion has arrived! With it has come demon hunters and lore and content and, of course, demons! But of all the new stuff to do, I’d have to say, my absolute favorite are the Legion Invasions. For those who haven’t done one yet, Legion invasions are pretty rad. 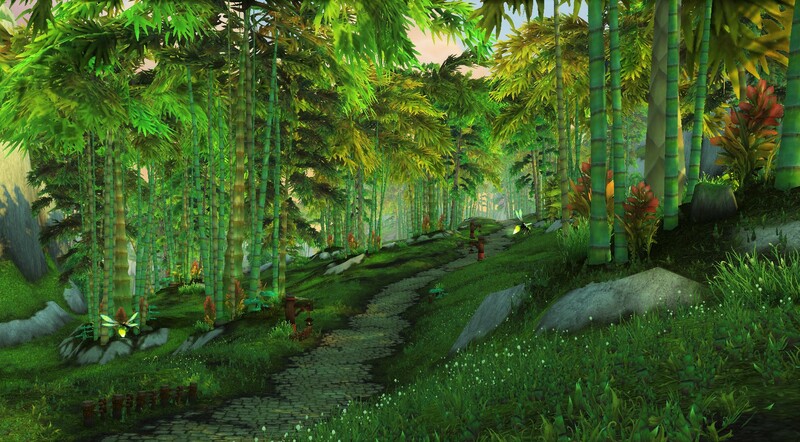 Every four hours the Legion invades two of the leveling zones in Kalimdor or the Eastern Kingdoms. During those four hours players of almost any level can enter the zone and help fight off the Legions demons who have started to overrun the area. The first phase, Stage 1, involves killing demons attacking the main town of the zone. Once that stage has been pushed to 100%, Stage 2 begins. A number of named demons, lower ranking officers, materialize and attack the town. Once again you defeat the demons and the trigger Stage 3. Stage 3 is my absolute favorite part of the invasions. In Stage 3, the Legion decides to full out invade the entire zone. Huge demonic structures grow out of the ground, enormous Legion commanders walk the zone, packs of lose demons roam this way and that, felfire rains from the sky, it is chaos, it is mayhem, and it is awesome! In order to push back this invasion, players can destroy the structures by taking out their powering crystals, take down the mighty demon elites, or go around healing and inspiring the denizens of the zone. Lots of action and lots and lots of Legion! Once Stage 3 is completed, you end up in the Final Stage. At this point, the Legion Boss in charge of this particular invasion appears in the main town. All the players come flying back and together start wailing on the demon lord. Depending on which demon comes down, the final stage can be a cake walk or it can be a graveyard run. Once the final demon is beaten, you’ve completed the invasion! Congrats! The invasions work with a nifty type of phasing in which entering the zone pulls you into a specific version where the Legion has just started invading so you can work your way through. There are multiple versions of the zone, all on different stages of invasion. This means you can complete an invasion in twenty minutes but the Legion will still be invading that zone for three more hours so you can swap to an alt and beat the invasion all over again. Man oh man, Blizzard has totally knocked it out of the park with this one. This is everything I could have ever wanted in a pre-expansion event and this isn’t the only part of it! I love that the town leaders get to shout dialogue across the zone and that you can recruit the NPCs in the zone to fight. I love that there are demons literally everywhere and the whole zone takes part. And most of all, I love that I can participate and actually help out as a healer! The damage that the demons deal, particularly the big ones, is nothing to snooze at. Without the aid of a friendly neighborhood healer, it is very very easy to go splat when tanking the final demon boss. And even before that, I can help push the percentages higher in Stage 3 by rescuing NPCs instead of fighting. For the very first time I’m getting to play my healer as a healer outside of instances. As fun as invasions are by yourself, they are even more fun in groups! I’ve been organizing what I call “Guild Invasion Groups!” where me and all of my guildies who are interested in running invasions all group up and go and kill some demons together. Like one big bonding experience! Once we complete the two invasions points on our mains, we then swap to our alts and do it again and again until either we get bored or run out of alts. I’ve run groups with as many as fifteen people in them and it’s been a total blast! The invasions also award armor, weapons, a new currency, a pet, and a couple of Feats of Strength but honestly, I would do the invasions if there was no reward at all. That’s just how atmospheric and awesome I find this event! Blizzard has really knocked this out of the park. And I can’t wait to see how it will ramp up! And we have the second part of the story! Part One can be found here. Thank you everyone for your words of encouragement! I will admit, I was a little nervous about posting this but you guys have been totally awesome! Enjoy the ending to the story! Today we’re breaking from the norm yet again; I’ve got another short story for you all! Because of the longer length of the piece (it’s nearly 6,000 words!) I’ve broken it up into two parts and placed this first part behind a cut. Part Two will be coming soon so stay tuned! And now, I present to you….